Who Are All These Reporters Who Attended an Off-the-Record Meeting With Donald Trump? 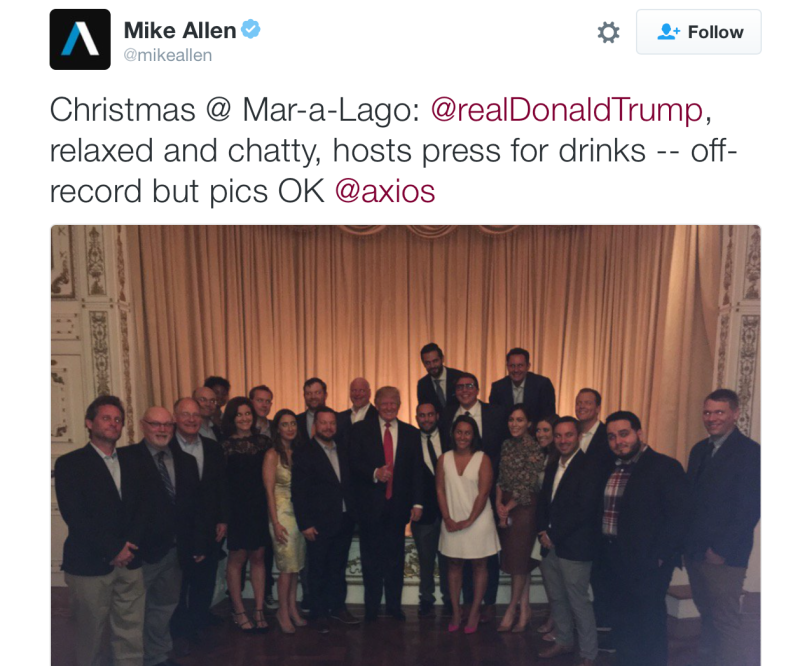 Behold, a row of national reporters who are not—at least not at first glance—deeply embarrassed to be posing for a photo at an off-the-record cocktail party with Donald Trump. Since that last presser, a lot has happened. Trump held the first presidential phone call with Taiwan since 1979, welcomed an admitted murderer to visit the White House, and invited his children, who are supposed to be running his businesses far away from him to eliminate any conflicts of interest, to sit in on multiple meetings. Still, some outlets enjoying access to Trump are doing their best to pierce these veils. Just kidding: Last week, The Politico fired a reporter who was already on her way out the door for tweeting about Trump’s relationship with his daughter, who he has repeatedly described as attractive and someone he might like to date. No mention was made of their concern that the tweet might make it even more difficult for them to get access to him. POETUS Trump stopped at an off the record gathering with reporters at Mar-a-Lago for 30 minutes which we are told is OK to report according to Stephanie Grisham along with Melania Trump, Reince Priebus, Kellyanne Conway, Stephen Miller and Jason Miller. So who are these 22 poorly-lit grinning sycophants who would go off-the-record for some chips and a free trip to Palm Beach? One of them is clearly Mike Allen—the former head of Politico who left to found Axios, standing fourth from the left, who posted the photograph on the internet for all to see. The man who is either extremely tall or standing on something behind Trump appears to be CNN’s Jeremy Diamond. Another participant appears to be Politico’s Tara Palmieri, fifth from the right, who earlier in the day posted an Instagram photo of herself up-close-and-personal with the President-elect. She got, as of press time, 261 likes on the photo. Any idea who the rest of them are? Jezebel is proud to offer up a free bag of Lays, a slice of meat, and some gross shiny pieces of bread to whoever correctly identifies the group first.